With Sober October over, it’s time to advance into No Remember November. 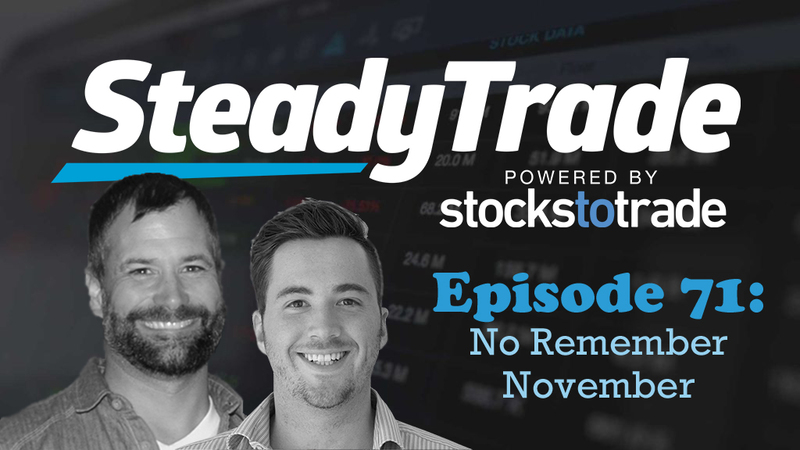 In this episode of the SteadyTrade Podcast, hosts Tim Bohen and Stephen Johnson are ready to party, but rather than with drinks or drugs, it’s with paper. Yes, you heard that right: It’s a paper trading party, as Tim and Stephen review the first week of the SteadyTrade Paper Trading Challenge! For the next several weeks, both Tim and Stephen will each act as mentors to teams of three traders looking to develop their trading prowess. Each trader started with a paper trading account of $30K, and with the guidance of their mentors, are hoping to build their accounts as much as possible. In Episode 69, you met the contestants. This week, they began to get their feet wet and execute their first paper trades. So how are things going? For the first few days, Tim told his team to do their own thing. All of his team members have a somewhat established routine, so he wanted to first see what they would do so that he could get a feel for what they are looking at and so that he could help them refine based on their personal style. Cara: Listen to hear how Cara chose a stock that was on the top of Tim’s watchlist and how it went. You’ll learn the ups and downs of this trade, and every trader will learn lessons about how to handle trades that don’t go your way. DJ: He’s open to long and short positions, and he’s Tim’s leader at the moment, up $1,600 in two days. Tim and Stephen discuss how focusing on VWAP when buying higher-priced stocks can help improve your success rate. You’ll also learn why it’s a good idea to remain open to both long and short positions. 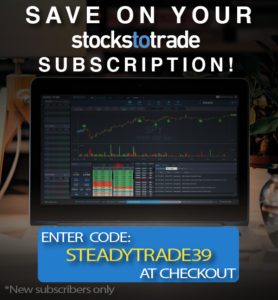 Josh: He focused on a stock that has been on Tim’s radar and on the StocksToTrade Watchlist. While he was busy this week and only went for one trade, he made a good one. However, it wasn’t executed perfectly. Tim and Stephen talk about how Josh’s fatal flaw was getting out too early, diminishing his potential profits. Is it possible that Josh is stuck in a “small account” mentality that could be holding him back? Frankly, Stephen is a bit worried about his team. Overall, they’re doing good things but aren’t considering all of the variables at once. He sees them chasing and not looking at volatility enough. Can he help them begin to see the big picture and improve their paper trading? Liz: She’s up about $2K, but Stephen is concerned that her methods aren’t sustainable, as she’s chasing stocks. It’s a common enough problem for traders: they’ll find a setup that works and works — and then suddenly it doesn’t. Tim and Stephen talk about how traders need to take a more long-term approach to trading mentally, otherwise they can fizzle out. Louis: While he’s showing great promise, Louis may be overextending himself in his trades. Tim and Stephen discuss specific things that Louis could do to improve his approach to swing trading, like sticking to VWAP holds. Be sure to listen up for key swing trading tips! Jude: She’s only placed one trade, but sometimes that’s not such a bad thing. As Tim and Stephen discuss, there are times to push, like when the weed stocks were going wild last month. But sometimes, if you’re not doing anything by pushing, the best tactic is to back off and play defense. Don’t overtrade. Don’t go crazy. Preserve your capital and focus on building knowledge. Do you have a question for Tim and Stephen? Visit the “submit your audio” portion of the website to ask us anything.